Addressing climate change has become a common issue around the world in the 21st century and equally an important mission in Chinese forestry. Understanding the development of monitoring and assessment of forest biomass and carbon storage in China is important for promoting the evaluation of forest carbon sequestration capacity of China. The author conducts a systematic analysis of domestic publications addressing “monitoring and assessment of forest biomass and carbon storage” in order to understand the development trends, describes the brief history through three stages, and gives the situation of new development. Towards the end of the 20th century, a large number of papers on biomass and productivity of the major forest types in China had been published, covering the exploration and efforts of more than 20 years, while investigations into assessment of forest carbon storage had barely begun. Based on the data of the 7th and 8th National Forest Inventories, forest biomass and carbon storage of the entire country were assessed using individual tree biomass models and carbon conversion factors of major tree species, both previously published and newly developed. Accompanying the implementation of the 8th National Forest Inventory, a program of individual tree biomass modeling for major tree species in China was carried out simultaneously. By means of thematic research on classification of modeling populations, as well as procedures for collecting samples and methodology for biomass modeling, two technical regulations on sample collection and model construction were published as ministerial standards for application. Requests for approval of individual tree biomass models and carbon accounting parameters of major tree species have been issued for approval as ministerial standards. With the improvement of biomass models and carbon accounting parameters, thematic assessment of forest biomass and carbon storage will be gradually changed into a general monitoring of forest biomass and carbon storage, in order to realize their dynamic monitoring in national forest inventories. Strengthening the analysis and assessment of spatial distribution patterns of forest biomass and carbon storage through application of remote sensing techniques and geostatistical approaches will also be one of the major directions of development in the near future. Increasingly, governments worldwide attach considerable importance to monitoring and assessing forest biomass and carbon storage against a background of global climate change. To help countries implement national greenhouse gas inventories, forest biomass and carbon stock assessments, the Intergovernmental Panel on Climate Change (IPCC) has provided default values for carbon accounting parameters such as biomass expansion factors (BEF) and root-to-shoot ratios (RSR) for boreal, temperate and tropical zones in the “Good Practice Guidance for Land Use, Land-Use Change and Forestry” (IPCC ). However, the application of these default parameters is fraught with great uncertainty. Development of individual tree biomass models and carbon accounting parameters suitable for national monitoring and assessment of forest biomass and carbon storage has become of fundamental importance. Over the last ten years, biomass equations for major tree species in America, Canada and some European countries have been developed or improved (Jenkins et al. ; Bi et al. ; Lambert et al. ; Snorrason and Einarsson ; Muukkonen ; Návar ; Blujdea et al. ; Fayolle et al. ). Their purpose was to assess and monitor forest biomass and carbon storage and to provide a basis for evaluating the contribution of forest ecosystems to the global carbon cycle. The Chinese government has made great efforts in the issue of climate change and signed the “United Nations Framework Convention on Climate Change”, as well as the “Kyoto Protocol”. At the UN climate change summit opening ceremony in 2009, the Chinese President Hu Jintao proposed to raise vigorously forest carbon sequestration in China and promised to increase our forest area by 40 million hectares and our forest volume by 1.3 billion cubic meters by the year 2020 from the 2005 level (Hu ). Since the start of 2009, accompanying the implementation of the 8th National Forest Inventory (NFI) in China, a program of national forest biomass modeling has begun to be implemented. This program was designed to develop individual tree biomass models and carbon accounting parameters for the major tree species in China, to provide a quantitative basis for estimating forest biomass and carbon storage and for assessing our capacity of forest carbon sequestration. In order to help readers understand the basic situation of monitoring and assessment of forest biomass and carbon storage in China, this paper reviews the development of forest biomass studies in China, especially the status and the latest progress of monitoring and assessment of forest biomass and carbon storage. At the end, some ideas for future studies are proposed. The earliest research on forest biomass abroad can be traced to the 1870s (Ebermeyr ). Studies on forest biomass in China has only been implemented since the late 1970s when some related articles were published (e.g., Li ), i.e., a century after the earliest study abroad. Due to special historical reasons, China did not participate in the International Biological Program (IBP), initiated by the International Union of Forest Research Organizations (IUFRO), during the period of 1964–1974 and thus missed the golden development stage of forest biomass research. Reviewing the development of more than 30 years in China, these preliminary studies started with estimating biomass and productivity of major forest types, gradually covering various other forest types in the country and then focused on the assessment of carbon stock of all our forest ecosystems. To monitor forest biomass and carbon storage in our national forest inventory (NFI) system, and to assure coordination between forest biomass and forest volume, compatible biomass models for individual trees of our major species were developed gradually. Monitoring and assessment of forest biomass and carbon storage based on the NFI data were subsequently conducted. Given the available literature, it appears that the earliest study on biomass assessment was conducted for two different forest types of Chinese fir, carried out by Pan et al. (), followed by studies on biomass productivity of major types of natural temperate forests on Changbai Mountain by Li et al. (), on Masson pine forests in Huitong County, Hunan Province, by Feng et al. () and on Chinese fir forests at the Yangkou Forest Farm, Fujian Province, by Ye (). As well, Chen et al. () studied biomass of Chinese arborvitae (Platycladus orientalis) forests, Xu () studied biomass productivity of major forest types in Daxinganling and Ma () developed biomass models for Chinese pine in China. Based on the results of biomass modeling of 11 tree species in northeastern China, Chen and Zhu () compiled the first biomass handbook of the country, i.e., the “Manual of Tree Biomass for Major Species in Northeastern China”. Since then, Liu et al. () and Liu () respectively studied the biomass and productivity of Larix gmelini and Larix principis-rupprechtii plantations, while Liu (), Fang et al. (), Luo () and Tian et al. () also conducted studies on biomass and productivity of Chinese fir, Masson pine and other major forest types. Feng et al. () systematically summarized biomass, productivity and the distribution pattern of different forest types in China. In short, through exploration and efforts over more than 20 years, we have been quite successful in assessing and monitoring biomass and productivity of major forest types in China. On the basis of biomass studies, Chinese scientists have started to assess carbon storage of forest ecosystems in China and their contribution to the global carbon balance since the beginning of the current century (Liu et al. ; Zhou et al. ; Wang et al. ). One of the most notable achievements was that of Fang et al. () who estimated the changes in forest biomass carbon storage in China between 1949 and 1998 using the improved method for estimating forest biomass as well as our national forest inventory data of the last 50 years, where a factor of 0.5 was used to convert biomass to carbon storage. The results show that Chinese forests released about 0.68 Pg carbon between 1949 and 1981, but increased the amount of sequestered carbon by 0.37 Pg from 1981 to 1998 (see Table 1). The main reason for this development is that since the mid-1970s, China’s massive afforestation efforts have increased forest carbon storage. From the data in Table 1, it can be seen that the amount of carbon in our plantations increased by about 0.39 Pg from 1981 to 1998, implying that carbon storage in natural forests decreased slightly during this period. Xu et al. () investigated the relationships between forest biomass density and forest age for 36 major forest types using our national forest inventory data from 1994–1998 and 1999–2003 and estimated the potential of forest biomass carbon storage in China for the 2000–2050 period, using statistical algorithms. The results show that the carbon stock in China’s forests would increase from 5.86 Pg in 1999–2003 to 10.23 Pg in 2050, suggesting that China’s forests should become a significant carbon sink in the future. Source: Fang et al. (). These early forest biomass studies were aimed at major or typical forest types, with developed biomass models largely based on stand or sample plot levels. Some biomass models were even based on individual tree data, most of them suited only for certain sites or local areas, not representative of larger regions. These forest carbon assessments were based on estimates of biomass per hectare for our major forest types from purposeful sampling and areas of forest types from our national forest inventory, which is not really suited for monitoring and assessing forest carbon storage. The “International Guidelines for Forest Monitoring”, published by IUFRO (), clearly defined forest biomass as one of the important items of global, regional and national forest monitoring. In order to add forest biomass into the items of national forest inventory of China, the Ministry of Forestry conducted a key program “Research on two-variable biomass models and compatible auto-adoptive one-variable biomass models for the major tree species in China” between 1995 and 1997. The program presented compatible individual tree biomass modeling approaches, which developed tree biomass models for 11 species or species groups, i.e., Larix, Abies, Pinus koraiensis, Tilia tuan, Acer mono, Fraxinus mandshurica, Juglans mandshurica and Phellodendron amurense in northeastern China, as well as Cunninghamia lanceolata, Pinus massoniana and broadleaved species in southern China (Xu ; Zhang et al. ; Luo et al. ; Zeng et al. ; Tang et al. ). Since then, Ning () studied a biomass modeling approach for stems, branches, foliage and entire trees and developed biomass models compatible with stem volumes for Pinus sylvestris var. mongolica plantations. Cheng () developed allometric equations for individual tree biomass from diameter and height for eight forest types of the Xiaolongshan Mountain in Gansu province. In the statistical investigations of the 7th National Forest Inventory of China in 2009, a thematic assessment on forest biomass and carbon storage was conducted. According to the assessment results, China’s forest biomass was 15.77 Pg and forest carbon storage 7.81 Pg (Li and Lei ). For that assessment, individual tree biomass models (not stand biomass models for major forest types) and carbon factors for the following 16 tree species (or groups) were collected and compiled, i.e., Picea/Abies, Tsuga/Keteleeria, Larix, Pinus koraiensis, P. sylvestris var. mongolica, P. tabulaeformis (including P. densiflora and P. thunbergii), P. armandii, P. yunnanensis, P. massoniana (including other pines), Cunninghamia lanceolata (including Taxus, Pseudotsuga, Metasequoia and Taxodium), Cupressus, Betula, Eucalyptus, other hardwood broadleaved species, other softwood broadleaved species and bamboo. Sample plot data from the 7th National Forest Inventory were used in this assessment. Forest biomass and carbon storage were estimated from plots, extended to populations and/or provinces and in the end aggregated at the national level (Li et al. , ). The thematic assessment results of forest biomass and carbon storage, as one of the 7th National Forest Inventory outputs, has been published by the government. As a result, the monitoring and assessment of forest biomass and carbon storage in China has managed to make a substantial contribution in this area. Coping with climate change issues has now become a special task of forestry in China, which has resulted in considerable progress in the study and assessment of forest biomass and carbon storage. The latest progress is largely manifested in two aspects. In first instance, this is the implementation of a national program for the development of individual tree biomass models and carbon accounting parameters for major tree species. Some of them have been published as ministerial standards, providing an excellent foundation for continuous monitoring of forest biomass and carbon storage and evaluation of forest carbon sequestration capacity in China. The second aspect is the implementation of provincial and national assessment of forest biomass and carbon storage based on NFI data, which allows monitoring and assessment of forest biomass and carbon storage in China to be compatible with international standards. Since early 2009, the National Forest Biomass Modeling Program began to be implemented. By the end of 2013, the program had been carried out for five years. Given the thematic research on classification of modeling population and procedures for collecting samples and methodology for biomass modeling (Zeng et al. ; Zeng , , ; Zeng and Tang , , ; Dang et al. , ), two technical regulations were published as ministerial standards for their application (State Forestry Administration of China, [2014a], [b]). On the basis of these two regulations, individual tree biomass models and carbon accounting parameters for the first group of five coniferous tree species, i.e., Cunninghamia lanceolata, Pinus massoniana, P. yunnanensis, P. tabulaeformis and P. elliottii, have been developed through an integrated utilization of mixed nonlinear models, dummy-variable models and simultaneous error-in-variable equations and subsequently published for application as ministerial standards (State Forestry Administration of China, [2014c], [d], [e], [f], [g]). Biomass models for the second group of eight tree species, i.e., Abies, Picea, Larix, Cryptomeria, Quercus, Betula, Schima superb and Liquidambar formosana, are in the development stage, which should be completed towards the end of 2014. Approval as ministerial standards for application will be sought. According to the study results of Zeng et al. (), tree species was the basis for classification of biomass modeling populations, followed by eco-geographical regionalization and administrative division. For tree species, two aspects were considered: one, classification of populations for biomass modeling should be compatible with that for volume modeling; two, assurance that the amount of stand area and volume stock for each separate modeling population of certain tree species (or group) is sufficient. Therefore, at first the proportions of standing volumes for all tree species were calculated based on the data of the 7th NFI and tree species in the top 30 of the list were determined. Secondly, the geographical locations for modeling populations in “Tree Volume Table” (LY/T 1353-1999) were confirmed, taking into account both eco-geographical regionalization and administrative division. In the end, the scheme of classification of biomass modeling populations was presented. 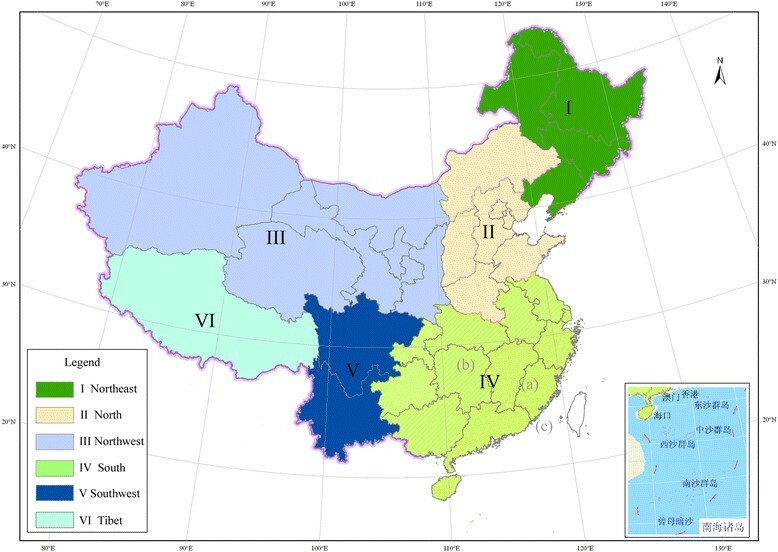 According to this scheme, China’s territory was classified into six regions (see Figure 1); all tree species were classified into 34 groups and 70 biomass modeling populations were specified. Specifically, 38 biomass modeling populations were classified for 20 coniferous species (or groups) and 32 populations for 14 broadleaved species (or groups). On the basis of geographical regionalization, 17 modeling populations were classified in the southwest, 16 in the south, 15 in the northeast, 9 in the northwest, 7 in Tibet and 6 in the north of China (see Table 2). Population classification for biomass modeling in China. Source: Zeng (). Note: 1) F-J-P means Fraxinus mandshurica, Juglans mandshurica and Phellodendron amurense; C-S-P means Cinnamomum, Sassafras and Phoebe. Other pines include Pinus densiflora, P. thunbergii and others; other coniferous species include Keteleeria, Taxus, Pseudotsuga, Metasequoia, Taxodium and other conifers; other broadleaved species include all broadleaved species except those listed for the region. 2) The decimal fraction expresses the proportion of stocking volume of the species. Source: Zeng (). Because equations 1 to 5 are related, estimation of the parameters requires the use of simultaneous equations (Zeng and Tang , , ). Owing to the different sample sizes for measuring aboveground biomass and belowground biomass, it was necessary to develop separate simultaneous equations for above- and belowground biomass. A height-diameter regression model can be used as a “bridge” to link two-variable biomass or volume models with one-variable models. If such a height-diameter regression model were introduced into the system of simultaneous equations, an integrated biomass equation system including both one- and two-variable models could be developed (Zeng ). Based on the biomass measurement data for 13 tree species (or groups), for which collection had been completed by the end of 2012, the individual tree biomass models were estimated using nonlinear simultaneous error-in-variable equations (State Forestry Administration 2014b). The parameter estimates are presented in Table 3. This table shows the equations for one- and two-variable individual tree aboveground biomass, belowground biomass and compatible stem volume models, biomass conversion factor models and root-to-shoot ratio models. These models provided the quantitative basis for estimating forest biomass and carbon storage in the 8th NFI of China. The reason for the development of biomass models for tree species (or groups), instead of modeling populations of Table 2, was to maintain consistency with those in the 7th NFI. Carrying out provincial or national assessments of forest biomass and carbon storage based on continuous forest inventory data has recently become the major direction of development. As a result, considerable progress has been made. Based on the data of our continuous forest inventory (CFI) between 1994 and 2008 in the Da-Xing mountains of Inner Mongolia, Fu et al. () used regression equations correlating biomass and stocking volume for different forest types to estimate forest biomass and carbon storage in this mountainous forest region and to analyze the dynamic changes of forest carbon storage and carbon density. Lu et al. () used continuous forest inventory data in Qinghai Province and employed biomass expansion factors (BEF) to estimate carbon storage and carbon density of forest vegetation in the province and to analyze development trends over the past 20 years. Based on the continuous forest inventory data from 1998 to 2008 in Fujian Province, Zheng et al. () used regression analysis to relate biomass and stocking volume for different forest types to estimate carbon storage and carbon density of forest vegetation and to analyze dynamic changes during this period. Wen et al. () used the continuous forest inventory data of Jiangsu Province in 2000 and 2005 in a continuous function method for biomass expansion to estimate forest biomass and net primary productivity (NPP) of the province and to conduct comparative analyses from age groups, dominant species and geographic regions. In the statistical analysis of the 8th national forest inventory of China in 2013, a thematic assessment on forest biomass and carbon storage was carried out. According to the assessment results, China’s forest biomass was 17.00 Pg and forest carbon storage 8.43 Pg (Xu ). The method applied for this assessment was almost the same as that used in the 7th NFI, but only seven old biomass models among 16 tree species groups were still utilized; for the other 9 tree species groups, 13 new biomass models were developed (see Table 3). Biomass models for Abies and Picea were separated from the Abies/Picea group, the biomass model for Pinus elliottii was separated from that of other pines, and the biomass models for Schima superb and Liquidambar formosana were separated from that of other broadleaved species. The assessment of forest biomass and carbon storage, the result of the 8th national forest inventory, had also been published by the government, which means that the monitoring and assessment of forest biomass and carbon storage in China have become the routine work. After developing for nearly forty years, the national forest inventory system of China has been in line with international standards in both methodology and techniques, with organization management and system operation effective and standardized. At about 415,000 the number of permanent sample plots is especially large with frequent remeasurement, seven times in total. The statistical results are quite informative, a rare global phenomenon. In general, the national forest inventory system of China ranks among the top in the world (Lei et al. ; Lin et al. ; Tang ). Viewed from the current direction of development, future monitoring and assessment of forest biomass and carbon storage could be improved in three ways. During the five year period of the 8th NFI, biomass sample collection for 15 tree species (groups) and 38 modeling populations had been completed (save for 2 of the 15 species, i.e., Cupressus and Populus, involving 5 modeling populations). Therefore only biomass models for 13 tree species had been established. When all the models for the 15 species or groups are developed, the biomass of about 70% of standing tree volume can be estimated. The other 30% of standing volume involves nearly 20 tree species (groups) and requires the establishment of more than 30 biomass models. In addition, there are large numbers of economic forests, sparsely forested areas, bamboos and shrubs in China. According to Fang et al. (), the biomass of these resources accounts for about 13% of the total forest vegetation. In order to monitor and assess the entire forest biomass and carbon storage, it is necessary to develop biomass models and carbon accounting parameters for bamboo species and shrubs (including economic shrubs). Besides live biomass and carbon storage (including above- and belowground parts), the carbon stock of all forest ecosystems should also include the carbon stored in dead trees, litter layers and organic soils (IPCC ). In future, all models and parameters related to monitoring and assessment of biomass and carbon of forest ecosystems will need to be developed and improved step by step. During the last two national forest inventories, thematic assessments were carried out for presenting the results of forest biomass and carbon storage (Li and Lei ; Li et al. , ). With the publication of individual tree biomass models and carbon accounting parameters for other species as ministerial standards in successive future national forest inventories, thematic assessment on forest biomass and carbon storage will gradually become a general monitoring routine, similar to estimating forest volumes (Zeng et al. ; Zeng ; Zeng et al. ). What is required is to consolidate individual tree biomass models and carbon accounting parameters with stem volume equations for all tree species (or groups) into our statistical software. In such a scenario we can present the results of forest biomass and carbon storage in related statistical tables and realize the dynamic monitoring of forest biomass and carbon storage in the national forest inventory of China. At a regional scale, on either a provincial or national level, the main method for assessing forest biomass and carbon storage is based on forest resource inventory data (Deng and Shangguan ; Li et al. ; Wang and Deng ). More recently, studies on forest carbon estimation combining forest inventory data with remote sensing data have gradually proliferated (Xue et al. ; Pang and Li ; Liu et al. ; Tu and Peng ; Huang and Chen ; Huang et al. ; Wang et al. ). Application of remote sensing from various sources, especially high resolution data, could greatly improve the timeliness of assessment of forest biomass and carbon storage. In addition, geostatistics, differential geometry and other technical means, have also been gradually applied in the analysis of spatial patterns of forest biomass and carbon storage (He et al. ; Liu and Ruan ; Zhao et al. ). Strengthening the analysis and assessment of spatial distribution patterns of forest biomass and carbon storage through application of remote sensing techniques and geostatistical approaches will be one of the major directions of development in the near future. I acknowledge the Forest Biomass Modeling Program in the National Forest Inventory (FBMP-NFI), funded by the State Forestry Administration of China, for providing biomass measurement data. I also thank the Forestry Departments of the various provinces for their efforts in sample collection. The author carried out the review, drafted and revised the manuscript, read and approved the final manuscript.